After qualifying twentieth, Bobby Labonte was stuck in the middle of the pack at the start of the MBNA Gold 400. Labonte wasn't able to move up throughout the field, as he had an extremely tight car. Then, when Bobby was about to be lapped, a caution came out. The crew adjusted on Labonte's Pontiac, but it didn't help the performance of the car. Bobby would hang around 23rd position until he went a lap down. "Early on," Labonte said, "I couldn't pass a soul. I pushed to the wall. I clobbered the wall. I should've lost a lap, and I did." Then, Bobby's crew finally got the car working well, and he began to move up through the field. From 17th position, Labonte caught the leaders and regained his lap. Being the fastest car on the track, Bobby then charged up through the field, working his way up to 3rd with 50 laps to go. A caution would come out then and the leaders would pit. Bobby made an air pressure adjustment and came out in third. But, during the caution, Labonte felt something wrong with his tires, so he came back in and changed his tires. One of the tires was going flat, and Bobby would've lost a lap had the caution not been out. 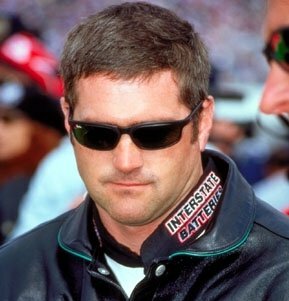 From the sixth position Labonte set out to win the race, but then he would lose a cylinder, changing his goal from winning to surviving. Still, Bobby amazingly moved up a position to finish fifth, and is now 3rd in the points, 7 behind second-place Mark Martin. "It's just one of those deals right there at the end. That caution came out and then we had a flat tire right after that. We got four more tires and then dropped a cylinder in it. We really don't know what it is yet, it just went away. It's very fortunate that we finished, so luck was on our side on that part of it. But, unfortunately, we weren't able to show what we had there at the end. We were the fastest car, but we were a lap down for a long time. We made it up and the car drove real good, the car was really good at the end. It was terrible at the beginning. We made a lot of changes to get it better and, for whatever reason, it came to life after that. It was a good day for us, and we still finished 5th on 7 cylinders." "We didn't start off the day right, so it wasn't like we led 389 laps and lost it at the end." Please E-mail me any comments or suggestions you have.